Each year, Rotary Club of Hilo Bay, in cooperation with the Harry & Jeanette Weinberg Foundation Friends Program, provides 100 hours of hands-on service to a local non-profit organization. An additional benefit of the work is that Weinberg Friends provides a grant of $10,000 to the non-profit of our choosing. We will issue a Request for Proposals (RFP) from non-profits for our 2016 project in the Fall of 2015. The deadline for the applications is November 13. Contact a RCHB member for an application or click here. 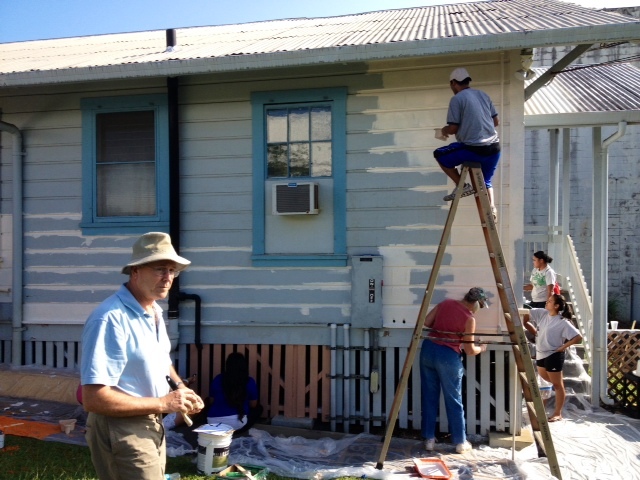 For our 2015 project, 26 members of RCHB, three other Rotarians and a couple friends spent the morning of Feb. 28 cleaning and painting the exterior of Beyond Shelter in Hilo, a transitional housing facility owned by St. Joseph Catholic Church and operated by HOPE Services. To see photos of the work day, click here. In 2014, RCHB painted the exterior of the YWCA of Hawaii Island's preschool building. The YWCA Preschool on Ululani Street in Hilo offers a safe place for youngsters to learn emotionally, intellectually and physically, to prepare for kindergarten. In 2013, we worked on the YMCA. Click here for photos. Over the years, RCHB has helped Weinberg distribute well over $100,000 in the East Hawaii community through these sweat equity projects. 2004-05 – Pukahi Scout Service Center, Stainback Hway. 2005-06 – Salvation Army — Honoka'a. 2007-08 – Kilohana Girls Scout Camp on Saddle Rd. 2009-10 – Habitat for Humanity Friends Service Project Restore.